My grandmother’s daughter is a classic text book psychopath. As a child to my late teens I was abused both mentally and physically to a terrible extent. One time she even badly beat my dog with a broom handle because I didn’t cry after a particularly horrific beating. I was made to never leave my bedroom. My own blood was often up the walls and over my pillows. Despite the physical pain I always felt on my body I think the internal pain was so much more, it eats me up over 20 years’ later. She constantly moved the lowest kind of men into the home, who wouldn’t even care about what she did to her children. Thing was though, she was always so charming to outsiders – I witnessed it over and over. She was even in a job which entailed trust and respect, but nobody saw what she really was. I escaped – I had to leave and make my own way in life away from that hell. I did ok, but was and still filled with anxiety and insecurities. I suspect if I saw a psychologist I would be diagnosed with PTSD. Unfortunately I had to never see the grandmother who I really love. I visited my grandma in my mid 20s once and SHE turned up. I felt sick to the stomach and was so depressed for the next year. Around 10 years’ ago she talked my father into moving near to her home (they divorced when I was around 11). Obviously then I had to cut ties with my father pretty much, there was no way I could see him. Besides, I felt very betrayed by him although he never knew exactly what my life with her had been. Sadly for some reason she contacted me to say she had put my father in a care home. He’d been very ill for a long time. I had tried to contact him in the past year or so but he never responded to me so I thought for some reason he had fallen out with me but he was very sick – and nobody told me. In the meantime she got power of attorney over him – his health and financial affairs all under her control. I challenged this and she sent me many long emails – some all upper case and misspelt an her ranting, and others written in a charming manner, such that they were being written for the benefit of others – mainly my father’s nephews and nieces who she has been manipulating and lying to. She was accusing me of wanting my father’s house and money, which couldn’t be further than the truth. All I want is for her to stay out of my father’s and my father’s family’s lives and stop lying, manipulating and being generally evil. ANYBODY else can have power of attorney over him as far as I am concerned, if it’s in his best interests, but her appointment is inappropriate. I feel sick to the stomach having to deal with her again, and extremely frustrated that nobody around can see her for what she really is. I don’t know why she is doing this. I want to be there for my father, but having to deal with this person is far too much for me to bear, I think I need to just turn my back on everybody and everything in this situation, walk away and never look back. I so much feel for you. My mother sounds the same and in the end my father just went along with her and would whip me just because she told him to. I had so much anxiety as a teenager and vulnerabilities I went on in life and seem to attract these psychopaths where ever I go. I finally, after 59 years had to establish NO CONTACT what so ever with any of my family members except my brother. I even have grown adult children who I believe have the genetics as they use their children to punish me and keep them from me if I do not give in to their manipulations. I am in immense emotional pain daily because I am so missing my grandbabies. I am completely alone with my two beloved dogs and God. I am writing a book in hopes of helping someone else in their struggles. God Bless You. I have a sister who fits your definition of psychopath with her sick actions. She follows me wherever I go and will not leave me alone. It is essential that I leave the area for my own sanity. However, I do not have the resources to leave just yet. She will not leave me alone and gets suspicious if I do. I am going to try to find a therapist who can help me deal with this. I am so sick of her that I sometimes wish her dead, then I feel guilty. I am a compassionate person. HOWEVER, I WANT HER OUT OF MY LIFE. She cannot get to my friends but she has the whole family turned against me, like cousins. I have dealt with this for 13 years. Her most recent actions have prompted me to look at the characteristics of a psychopath. She is so sick. And I hate her. And yes, I am deteriorating while she thrives with her believable, charming act. She has also gotten away with being above the law when she physically abused me. She filed a restraining order against me. I don’t want sympathy, I NEED HELP. I copied the characteristics from your site and will post them in a secret place to remind me of who she really is, how physically sick(she makes me want to vomit) she makes me and to run like hell. I get stuck with “oh well that isn’t that bad. I fear one day, she/her behavior will kill me. Thank you. Leave. Please just leave. Trust me you will make a better life for yourself. I have been dealing with an aunt and grandmother. When I live my life without them, my life is beautiful, people are good and so is everything else. I am stuck too and have nowhere to go, nor a job nor a steady income and on top of that I fear that she will follow me there too. I don’t know how to keep her out. She is my mother’s sister and has a firm grip on my mother’s guilt for leaving her and is now starting her tactics on my brother. I wish I could just leave, take my family too and know that she won’t be able to come there nor us visit her nor call us nor we have to come to her for anything but that seems impossible. And on top of that the victims can not see her real face and I don’t know what to say. It seems whatever I say lets her in more. Its a loosing battle. Don’t fight, leave. Go some place she can not find you. Never let her back in your life no matter what. You are much better than this. I know it is hard but know that once you get out the most wonderful people will find you and you will live a joyous life. I am stuck where I am because I am protecting my parents and siblings and as many people as possible- relatives, siblings friends, everyone and anyone needs to be protected and there is really no one else in the middle except me. I am hated, am in physical danger and people think I am the crazy one but I really have no solution to end this. Me going away does not put an end to her, it leaves my mother in her grip. I wish this was easy. I discovered earlier this year that after decades of constantly doubting myself and my own version of reality, watching our parents being somehow magically manipulated by her against me, having my mother believe that I hate her, having all our oldest family friends look into no at me as though I’m an evil perverted demon that she is and has been for fifty years, lying through her teeth about me, our relationship AND REALITY! It was another family member who told me that he believed I had lied about a particular event, when I, finally (!!! ), and because that event was quite recent, realised from that, that she had built a whole life of utter and total deceit. I don’t think that the is anything other than getting them out of our lives that we can do. Very sad, very outrageously unjust, but that’s the reality. I hope that when I finally manage to do so that I will b able to live as “me” at last, without doubting myself and my own memory and integrity! As I’ve only just seen this website, and your post, I do hope that by now you’ve managed to break free and get away from your “nutter”! Failing that, have you tried cctv, as (in Britain) that’s the only type of evidence that is legally admissible, although I hope it doesn’t come to that..
With love to you, and for your future. Peace and happiness to you. I know my father would retaliate at first because these people surrounding him are such good manipulators but once I take him away I know he’d be grateful later. I hope you find the support and strength you need and my best wishes are with you. I wish you health, safety, peace and comfort. 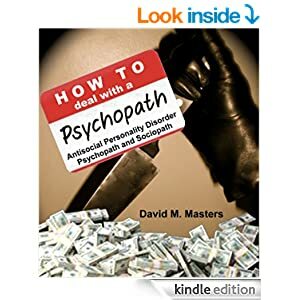 I am desperate for help and understanding in dealing with a sociopath. How do I share my Story? I am new to this and have never tried to seek help online or any other ways. I am not sure how to get started. Terrible. I’m so sorry that you have had to experience so much pain from a maternal figure. I do have a few words of caution though. Be careful with this evil granny, even now as an adult. Always deal with her when there’s a witness. Given her history of brutal violence, you never know what she might try to do to you. My psychopath ended up with a gun to my head. Next Next post: Please Help Me! I am in Love with a Psychopath!